Focus on endemics such as charismatic lemurs, chameleons, and birds in this hotspot of diverse ecosystems. Madagascar is well known as one of the greatest destinations in the world with over 90% of its wildlife being endemic. Our 24-day tour with maximum time in nature provides the perfect opportunity to get to know this island’s unique species well. This special itinerary caters to the pace of nature lovers and photographers offering several days in each special habitat to enjoy these incredible landscapes and their animals. Travel with Doug and Gail Cheeseman, who have 60 years of combined experience leading trips to Africa, and who will be accompanied by local wildlife specialist Solohery Rasamison. • Leaping lemurs! Experience the sights and sounds of over a dozen species of lemurs such as the dancing sifakas, the curious Ring-tailed Lemurs, and the beautiful Black-and-white Ruffed Lemurs. • And leaping lizards! Madagascar is home to half the world’s chameleons, as well as unique species of geckos and iguanids. • Discover an astounding array of endemic birds, including couas, mesites, ground-rollers, and vangas. • Seek out the things that go bump in the night! We’ll have many opportunities to go night-spotting in search of nocturnal lemurs, birds, frogs, and other creatures. • Journey through the island’s varied landscapes encompassing coast, desert, farm, wetland, and forests, including the quintessential towering baobabs with their majestic crowns. • Continue your journey early on our Tsingy extension from August 15 - 24, 2020. You’ll see the impressive geologic Tsingys and Avenue of the Baobabs, and experience the unique species that reside within the beautiful Kirindy Forest. Observe endemics such as Madagascar’s largest predator, the fossa, the world’s smallest primate, Madame Berthe’s mouse lemur, and an abundance of endemic birds. Jul 27 - 28 Travel to Madagascar from home. Aug 19 Arrive home today or yesterday depending on your flight schedule. Solohery has been doing bird surveys and monitoring programs around Madagascar since 2003 and has published four scientific articles on birdcalls. After earning a Master’s degree in Conservation Biology, Solohery began guiding natural history trips across the island. Being one of the most experienced and respected resident Malagasy guides, he knows the local biodiversity well and greatly enjoys guiding wildlife group. He is enthusiastic, extremely well-versed on Malagasy history and culture, speaks fluent English and French, and has a great sense of humor. Arrive in Antananarivo (also known as Tana) either in the afternoon or evening. In the afternoon, join an optional visit to Lac Alarobia for birding. Meet our resident guide, Solohery Rasamison, and fly to Mahajanga. From there, drive two hours to Ampijoroa, your forest station destination situated in the extensive tropical deciduous forests of Ankarafantsika National Park. On the way, you will come across the extremely picturesque rice paddy scenery. You may stop to scan water bodies for herons perhaps doing their “umbrella-feeding” performance. Once you arrive in Ampijoroa, enjoy early morning as well as nocturnal walks from your cabin in search of wildlife. With luck, you may encounter the fossa, a very shy endemic mammalian predator. With our leaders and local guides, spend the day exploring the network of trails. Ankarafantsika National Park comprises 135,000 hectares of parkland where the local Sakalava people still live. Eight species of lemurs occur near camp. If you are lucky, you may find the golden-brown mouse lemur, one of the world’s smallest primates. Additionally, Coquerel’s sifakas live in family groups that thrive and are extremely active throughout the forests, even going right through the camp area. You will encounter some of the region’s endemic reptiles such as Cuvier’s Madagascar swift, Oustalet’s chameleon, and the rhinoceros chameleon. 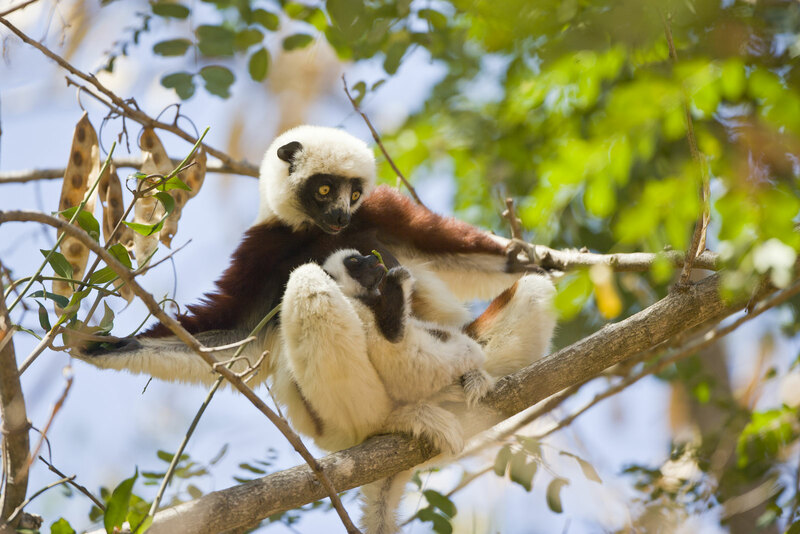 This morning, enjoy wildlife action in camp and the adjacent woodlands, watching and photographing sifakas and birds, then drive back to the coastal town of Mahajanga for a flight back to Tana for an overnight. Fly to Fort Dauphin and drive to Berenty Lemur Reserve, a privately-owned sanctuary near the southern tip of the island. The three-hour drive to Berenty starts from the windy, picturesque town of Fort Dauphin on the coast, down roads bordered by rice paddies, and into the rain-shadow of the Andohahela Mountains. Didierea trees resembling octopus are the signal that you have arrived in the “spiny desert” habitat of Madagascar. Berenty Reserve belongs to the De Haulme family who have set aside sections of gallery forest along the Mandrare River to conserve its population of lemurs and other wildlife. A lot of research has been done in the Reserve on lemurs, making several species quite relaxed with people nearby and providing you with a great opportunity to get close to these unique animals. Here you will have close encounters with the endearing ring-tailed lemurs and you may also see Verreaux’s sifakas hopping across the trails and sometimes down the dirt road outside the lodge. Giant couas, Madagascan cuckoo-hawk, and other forest birds will be among the many highlights. You will also go out at night to see nocturnal creatures such as the greater hedgehog tenrec, several geckos, white-footed sportive lemur, and gray mouse lemurs. The nighttime skies may also be clear enough to see the Southern Cross, Milky Way, and other diversions, making your experience even more enchanting. There is also a Madagascar flying fox roost where these impressive bats spend their day squabbling and sleeping, though close approach of these roosts is discouraged so as not to disturb them. There is a local museum you will visit which has one of the few complete giant elephant bird eggs in the world. After some early morning photography of the approachable wildlife in Berenty, return to Fort Dauphin to fly across the island to Tulear. Then, you will drive to Ifaty by four-wheel vehicle. En route, you will stop to look for the uncommon Madagascar plover, and in the wetlands and salt pans you pass, you may find greater flamingo, black-winged stilt, and Malagasy harrier. The famous “Spiny Forest” around Ifaty has fascinating succulents in many shapes and sizes, known as Didierea woodland. The biggest is the baobab tree. You’ll start exploring at dawn, when the birds are most active and stroll amongst the many succulents and thorny scrubs. Many avian endemics live in this arid land, such as sub-desert mesite and the noisy sickle-billed vanga. As the day warms up and reptiles get active, you will have great opportunities to see Madagascar iguana and maybe the western or Dumeril’s boa. In addition to your woodland walks, the tropical ocean off Ifaty is fairly good for snorkelling. There will be masks and snorkels available to swim in a coral reef or relax in the warm shallows in front of your hotel. Join an afternoon excursion to the beautiful wetlands south of Ifaty in search of water birds and other wildlife. Drive southeast to Zombitse and on to Isalo National Park. After an early morning search for Ifaty’s diverse birds, you will make your way down to Isalo National Park via Zombitse Forest. 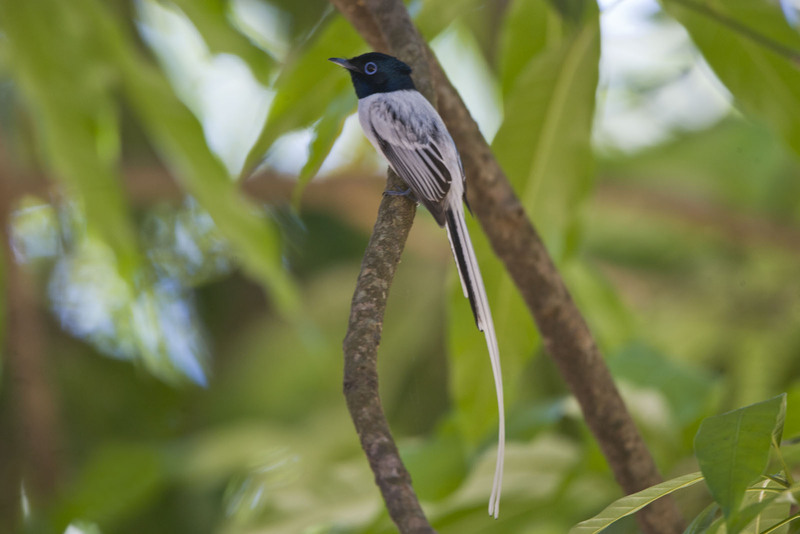 In this forest, you will have a chance to see Appert’s tetraka, a species listed Vulnerable by Birdlife International and which can only be found within two small regions of south-west Madagascar. Other highlights you may encounter include Madagascar ibis, Madagascar harrier-hawk, Madagascan cuckooshrike, Malagasy paradise flycatcher, and Madagascan spinetail. This region is also habitat for the shy fossa, which you may come across with a little luck and patience. In the afternoon, you will navigate your way to Madagascar’s highlands to reach Isalo National Park. In this highland region, you will witness many magnificent geological formations, carved by small waterways which attract diverse wildlife. You will spend a full day and a half exploring this bizarre and picturesque landscape. Within this dry region, birds are diverse and omnipresent, providing you with a high likelihood of spotting new species. There are also many reptile and amphibian species you are likely to encounter such as Dumeril’s boa, white-lipped bright-eyed frog and the Malagasy rainbow frog. You will also join both day and night walks in the hope of finding all six lemur species which reside in the region, half of them being nocturnal and the others being diurnal. Today, you will embark on a full-day drive from Isalo to Ranomafana National Park. The drive will take you through winding grassland interspersed with granite hills. Stay on the lookout for the rare and elegant Malagasy harrier gliding above the grasslands in search of prey. Once you reach the eastern slopes of Madagascar’s mountainous center, you will enter the Ranomafana National Park. Unlike the previous parks you will have visited, Ranomafana spans across a large range of elevations, encompassing many different forest types. At lower elevations, you may encounter previously seen wildlife. However, once at higher altitudes, you will find many new species that are impossible to see anywhere else in the world. The rare and endangered yellow-bellied sunbird-asity can be found making their way from one branch to the next, rejoicing as they come upon fresh nectar. These birds will mesmerize you with their iridescent blue and yellow feathers, complimented by green speckles. Reach the ridge-top forests for a chance to encounter beautiful vistas as well as Madagascar yellowbrow, the elusive Pollen’s vanga, and many other new species! Ranomafana is also an especially rewarding place for night walks due to the high number of amphibians and reptiles. You will have a chance to observe some of the 100 species of frogs that have been recorded in this park. You will explore one of the island’s last highland marshes which has many unique species including one of Madagascar’s most elusive birds, the slender-billed flufftail. Of course, you will have plenty of encounters with lemurs in this forest, including the highly localized golden bamboo lemur. Other mammals to be on the lookout for include the adorable streaked tenrec and the elegant ring-tailed mongoose, two small, but incredibly charismatic species. Ranomafana National Park will keep you on your toes as you will continuously stumble from one habitat to the next, being endlessly surprised by the diversity and beauty of Madagascar’s wildlife and natural heritage. You’ll have a scenic four-hour drive north that allows time for plenty of photography stops from Ranomafana to Antsirabe where you will overnight in a picturesque town en route to the famous Perinet Special Reserve. Depart early to drive east to the Perinet Special Reserve across the Highland Plateau where you will be immersed in tropical wet forests on Madagascar’s eastern escarpment. Your accommodation for the next four nights is located between Perinet Special Reserve and Mantadia National Park. You will undoubtedly meet some of the resident wildlife at the lodge including geckos, chameleons, Madagascar wagtails, and indri lemurs. Indri, the largest living lemur, is only found in the habitat of Perinet and Mantadia. With three full days of field time and the help of multiple guides, you should have many opportunities to see, hear, and photograph indri. You will also see many other species of lemurs here, including gray bamboo, furry-eared dwarf, wooly lemur, black-and-white ruffed lemur and the diademed sifaka. Even if you don’t see them all, remember to listen carefully as you will hear them calling from not too far away. Each evening, you will have an opportunity to join optional night walks to explore the area’s nocturnal inhabitants. Geckos, chameleons, and colorful frogs are often heard during the day, but are more easily seen while night-spotting. It is also good to note that none of the snakes found on Madagascar are venomous. Special birds at Perinet and Mantadia include five families endemic to the Malagasy region: mesites, ground-rollers, the cuckoo-roller, Malagasy warblers, and vangas. You will see many of these birds directly from the roads which criss-cross the reserve, but resident guides may take you up the trails into the rainforest to catch up with one of the endemic shy species that has just been located. Forest walks throughout your itinerary will be very exciting. You’ll have a scenic drive west that allows time for plenty of stops for photography from Perinet Special Reserve back to the Antananarivo. Continue on our Tsingy extension or relax for the evening and prepare for your flights home. Depart Antananarivo either very early in the morning and arrive home later today or depart in the afternoon and arrive home tomorrow. Experience the unique species that reside within the beautiful Kirindy Forest and Tsingy de Bemaraha National Park. Madagascar is known as one of the greatest global destinations with over 90% of its wildlife being endemic. Costs are per person, double occupancy, not including airfare (except four internal flights within Madagascar), singles extra. See Included and Not Included sections for more details. Four internal flights within Madagascar. Accommodations for the nights of July 29 through August 17. Meals from dinner on July 29 through breakfast on August 18. Airport transfers on July 29 from airport to hotel and on August 18 from hotel to airport. Bottled drinking water, juice, or soft drink with lunches and dinners. Snorkeling gear on loan in Ifaty. All airfare, airport and departure taxes, and excess baggage fees. Airfare is approximately $2,000 to $3,000 from the US to Antananarivo, depending on origin. Gratuities – tipping is, of course, discretionary, however we suggest budgeting about $20 to $22 per participant per day for July 29 to August 17 with our main guide, plus local drivers, local guides, and hotel/camp staff (about $400 to $440 total per participant). This does not include any optional trip extensions. All drinks except bottled water, juice, or soft drink with meals. Items of a personal nature such as laundry, telephone calls, medical costs or hospitalization, room service, alcoholic and other beverages,and items not on the regular menu, etc. If you have special dietary needs, please indicate them on your Reservation Form. The months we have chosen to visit are in Madagascar’s cooler dry season; however, the places we’ll be traveling to will be quite warm during the day and cool off at night. Daily temperatures will typically be in the range of 75 to 92°F (24-33°C). Nighttime temperatures will typically range from 52 to 75°F (11-24°C). We will make a number of early starts in the morning to maximize the most pleasurable time in the field when the wildlife is the most active too. As with many destinations, expect variable weather conditions and bring layers. This Madagascar tour requires a reasonable level of fitness and participants should be in good general health. Most of the wildlife viewing and birding will be done on foot and may require walking for several hours at a time. A few forest trails can be steep and slippery, especially after rain. Locating some of the endemic species may require a few longer walks. We strive to spend maximum time in nature and days are long and fairly demanding, though there is some flexibility to opt out of certain activities. Please contact us if you have any health concerns that may make this trip challenging. Unless listed as included, airfare is not included in trip costs. Detailed flight information and the contact information for our recommended flight-ticketing agent are included in the Trip Materials we will send you. Please let us know if you are arriving earlier or staying later as we are happy to assist you with any extra overnights that you might want to arrange. Flights you (or a travel agent) book: Arrive in Antananarivo (TNR) no later than July 29. Depart from Antananarivo (TNR) on August 18. If you are continuing on our Tsingy extension, see the Flights section in its itinerary for departure information. Flights we book for you: The four internal flights within Madagascar.The cost of this round-trip booking is included in the tour cost. The lodges we stay in are nice and comfortable, though we do stay in one “rustic” lodge in Ampijoroa. All lodges have private bathrooms. Lodging choice is quite limited in Madagascar and we aim to select the best available. Travel is by bus, four-wheel drive vehicle, and internal flights. Roads range from paved to dirt that can be dusty and bumpy. Please note that internal flight delays and last-minute flight schedule alterations are an inherent risk in any tour to Madagascar and we may have to re-arrange the tour itinerary around the internal flight schedule. However, we will still visit all the scheduled sites and will take all reasonable precautions and actions to ensure the tour follows the advertised itinerary as closely as possible.